I’ve said it before, and I’ll say it again: First Second publishes great graphic novels. I consistently adore their titles (Check, Please! Shattered Warrior! The Prince and the Dressmaker! 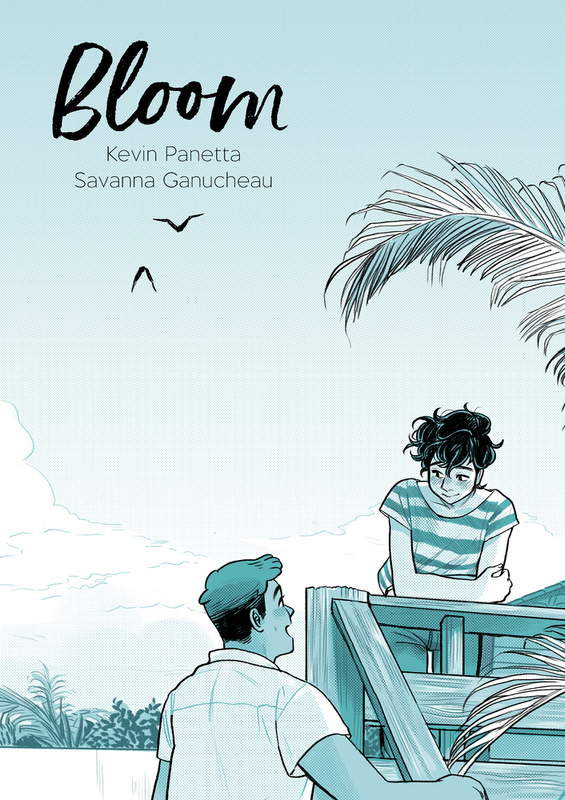 ), so it’s no surprise that I was looking forward to Kevin Panetta and Savanna Ganucheau’s Bloom as soon as I heard about it. Umm, also, it ticks several of my “favorite things” boxes?? A of all, it’s a book about cute boys working in a bakery, and B of all, it is a sweet LGBTQ+ romance with lots of heart. Oh gosh, I loved it a lot. Now that high school is over, Ari is dying to move to the big city with his ultra-hip band—if he can just persuade his dad to let him quit his job at their struggling family bakery. Though he loved working there as a kid, Ari cannot fathom a life wasting away over rising dough and hot ovens. But while interviewing candidates for his replacement, Ari meets Hector, an easygoing guy who loves baking as much as Ari wants to escape it. As they become closer over batches of bread, love is ready to bloom . . . that is, if Ari doesn’t ruin everything. You know how there are stories that just feel like food for the soul? They may make you cry a little, but they mostly fill you up with that bubbly, content feeling of that-was-just-what-I-needed? Bloom is one of those stories. Panetta and Ganucheau have collaborated to create a beautiful book, and luckily it’s a *good* one too. Things I liked (get ready, there are many): Ari’s family is part of the story. Young adult and children’s lit gets dinged a lot for having absent parents to build plot, so it’s absolutely wonderful to see whole family and realistic parent-kid relationships in books. Conflict in Bloom builds out of differing expectations for Ari’s future: his dad wants him to help out in the struggling family bakery, and he wants to follow his friends out into the unknown. To add to that, Ari’s family is solidly working class, and not sure if their business will survive. There’s no college-bound future here, and I can’t think of the last YA book I read that included a family like Ari’s, where economic uncertainty is part of the story. I also really loved how Ari’s relationship with his high school/band friends played out. It was authentic in a little-tough-to-watch kind of way. Those moments when you realize you’ve outgrown your friends, or they’ve outgrown you, or maybe you were never really friends to begin with? Super poignant. The title of the book really points out what’s happening here: not only a sweet love story, but a real growing up and turning your face to the sunshine kind of maturing. And it’s illustrated to match! I adored that certain panels (no spoilers!) had flowers creeping over the edges. Speaking of illustration, Ganucheau really hit it out of the park. I mean, gosh, it’s a gorgeous book. And the two-toned illustrations in shades of teal really worked in a way I wasn’t expecting. And the baking collages! *heart eyes* What can I say, I am a sucker for cute boys + baked goods. On the note of baked goods, there’s a recipe at the end! If you can finish this book without wanting to go whip something up in the kitchen, you can safely say you have a will of iron! So it’s very convenient that there’s one just at the end, how nice and thank you v. much to the authors. Also p.s. I adored the nods to Hector’s Samoan and the Kyrkos family’s Greek backgrounds with the food they made. Ugh, I loved all of it. I think you will too. So if you’ve ever swooned over a fictional boy throwing bags of flour over his shoulder (and I know you all have – don’t lie to me! Peeta from The Hunger Games happened, we all remember that right?? ), and/or just want to read an adorable slow-burn romance with lots of flirting and blushing, this is the book for you. Recommended for: fans of Check, Please! and Heartstopper, and anyone who likes comics about finding yourself and finding your way, with a little romance baked in. Fine print: I received an ARC of this title for review from the publisher. I did not receive any compensation for this post. The very first thing you notice about this picture book is the gorgeous cover art. 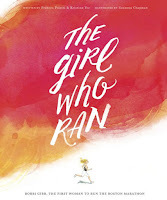 The Girl Who Ran in large, white font, against a fiery watercolor background slanted crosswise on the dustjacket. And then you see the little picture of Bobbi Gibb at the bottom, running with her hair streaming behind her, echoing the colors above. If it gets you to pick up the book, the cover has done its job. In this case, I don’t see how anyone could resist it! 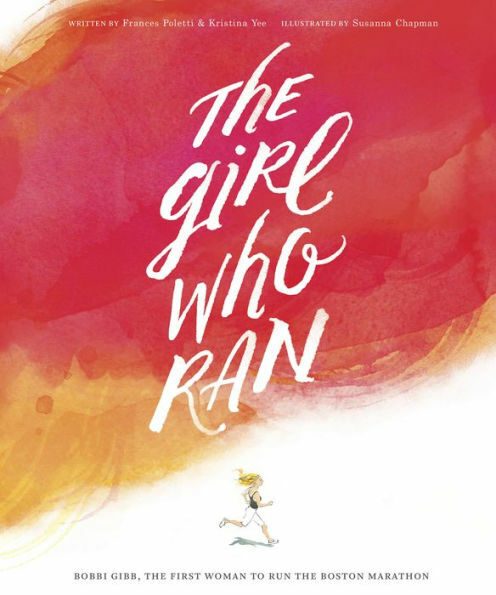 Frances Poletti and Kristina Yee's picture book, The Girl Who Ran: Bobbi Gibb, The First Woman to Run the Boston Marathon, illustrated by Susanna Chapman (who also created that gorgeous cover!) tells the story of Bobbi Gibb. Who is Bobbi Gibb? She is the first woman to run the Boston Marathon (the most famous marathon in America). Bobbi loved to run from a young age, and she ran, as the book repeats, “like the wind in the fire.” The book chronicles how attitudes toward her running changed as she grew up – she faced not only official rejection from race officials, but at home, from her family. But after secretly training and determining to race, Bobbi would not be dissuaded. And her mother changed her mind! So Bobbi ran, right into history. And her life, and the lives of others changed because of that. On one hand you could characterize this picture book as an inspirational biography for younger readers. But really, it’s more than that. The prose is lyrical, and it’s accompanied by lovely art that will appeal to any reader, whether they prefer nonfiction or not. It also doesn’t hesitate to tell the story of familial disapproval and conflicts between traditional gendered expectations and personal aspirations – something that we can always use more of in books for younger kids. As expected in a book about a runner, most of the page spreads show movement, and the illustrator portrays this with the swirls of watercolor “fire” so that you can see Bobbi’s path through the landscape. The art really shines, and in the final pages, at the marathon finish line, there’s a foldout spread that broadens the scope of the moment into something dramatic. Another positive: at the end of the book there’s a concise 2-page spread with both a formal biography and a timeline showing Bobbi’s marathon runs, Boston Marathon milestones and women’s involvement. It would be a good starting point for a school project! In all, The Girl Who Ran is a beautiful picture book that illustrates the value of persevering despite setbacks, or even the disbelief or opposition of your family. Recommended for: readers ages 6-9 who are interested in nonfiction biographies, running, and people overcoming the odds, and folks any age who enjoy positive, inspirational stories. Fine print: I received a copy of this title for review from the publisher. I did not receive any compensation for this post.